Back in 2006 when I (Hazel Hill) started in private practice I looked at various places to rent to see my clients. I finally choose Wainwright Therapy Centre to launch my Counselling practice, Counselling in your Community. Wainwright Therapy Centre was owned by sister and brother, Jan and Colin Wainwright. Their Father was an osteopath and opened the business in the 1970’s within their family home. They soon expanded and converted the house into a therapy centre offering osteopath and other therapies. 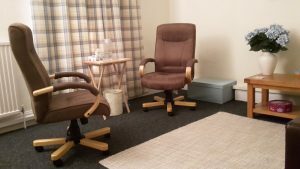 They converted one of the rooms into a counselling room, and I felt that would be ideal for me. I choose Wainwright to practice as it was welcoming, quiet and friendly. 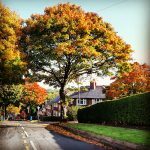 It was located near a bus stop and within easy walking distance from town, and convenient to both Ecclesall and Abbeydale Road. The last 10 years Jan and the centre have supported my counselling therapy business to grow into, what is now, a thriving counselling practice. It came as no surprise when Jan announced her retirement at the end of last year but it was sad that they took the tough decision to sell Wainwright Therapy Centre Business and premises. All of the therapists were left with a few months to find new locations. Over the years, I have built good relationships with local businesses and have built a good reputation in the area. I wanted to maintain this. Therefore staying in the area was vital to me. I also wanted toas retain my independence. A chance conversation with Gail Evans, co-owner of Cornerstone Counselling, revealed that they wanted to open a room in Netheredge. It was an opportunity to stay in the area, maintain my independence and have the opportunity to network with new colleagues. I therefore jumped at the chance to move just around the corner. In the middle of February, I moved all my counselling clients to 59 Wostenholme Road, Netheredge, S7 1LE. My practice still consists of a combination of my own clients, Employment Assistance Programme Work, BUPA and Aviva clients. My new addition is that I now take on a few referrals every month from Cornerstone. It has been a great and positive move. I have lots of support from Cornerstone, and love that I am still in green, leafy Netheredge. The room is discreet and in a quiet part of the building. The room has the morning sun and is perfectly fitted out for both one to one sessions, as well as seeing couples. As you can see from the photos on the left, it is an inviting room. Clients have given positive feedback on the room and the ease of the location. Parking on-street was often a struggle at Wainwright, when they extended the parking zone. Good news is that my new location has plenty of on-street parking. You can park on Wosteholme Road itself or at any of the nearby Roads – Thornsett Road and Kenwood Park Road. My new location is served by bus 3 which runs regularly from Sheffield town centre and takes just 12 minutes. It is a 7 minute walk from Abbeydale Road and Forge Bakery (a great place for me to have my lunch). For further instructions to how to find 59 Wostenholme Road and my counselling practice, click on this link. I rent the room on during the daytime on Monday, Wednesday and Thursday. I also rent the room on a Tuesday evening. I continue offering Skype counselling and Supervision during the day on a Tuesday and Thursday evening. I do not work on Fridays. Everything has stayed the same. I take all the bookings and manage all the administration and marketing. The only difference is that I do not have a reception. I therefore ask all my clients to turn up just a few minutes before the session begins. If a client chooses to bring along a friend, there is somewhere from them to wait, and a place for them to make a tea or coffee, if they choose to. I still specialise in Workplace Stress, car and bike accident trauma, skin disorder, stress and anxiety, couple and relationship counselling, coping with long term illness and expat/aid work counselling. I’ve kept all my supervisees who continue to support trainees in their placement and studies and support supervisees through the BACP accreditation process and private practice work. 59 Wostenholme Road in Netheredge, Sheffield..